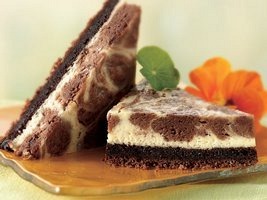 Brownie Swirl Cheesecake is an easy cheese cake recipe that makes an elegant dessert. No baking experience is required to make this decadent, rich dessert. Starting with a brownie mix crust, this brownie cheesecake recipe is ready for the oven in no time at all. 1. Preheat oven to 350 degrees F. Grease a 9-inch springform pan. 2. Prepare brownie mix according to package directions for chewy fudge brownies. Spread into springform pan. Bake for 15 minutes (brownies will not test done). Remove from oven and let cool for 10 minutes on a wire rack. 3. Meanwhile, in a bowl, combine the cream cheese, sugar and vanilla. Add eggs, one at a time, beating well after each addition. 4. Pour cream cheese mixture over the brownie crust. Top with melted chocolate chips. Cut through the batter with a knife or skewer to swirl the chocolate. 5. Bake at 350 degrees for 35 to 40 minutes or until center is almost set. Remove from oven and run a knife around edge of pan to loosen. Cool completely on a wire rack. Remove sides of pan and refrigerate for at least 3 hours. Garnish with whipped cream, if desired.